Because Bologna is so far inland, I thought I might get a walk on the beach in Rimini last week, either on my way to San Marino, or the way back. Rimini, a city of about 225,000 146,000 people on the Adriatic coast, is one of the best-known seaside resorts in Europe. The sandy beach stretches for 15 km and there are more than 1,000 hotels, and thousands of bars, restaurants and discos. The story of Rimini as a resort dates back to the 1840s, but this also a city with important Roman and Renaissance monuments, and the hometown of the Italian movie director Federico Fellini. This part of the Italian peninsula was a part of Etruscan civilisation until the arrival of the Celts, who held it from the 6th century BC until their defeat by the Umbri in 283 BC. But the city of Rimini dates from 268 BC when the Romans founded Ariminum. After Julius Caesar crossed the Rubicon, he made his legendary appeal to the legions in the Forum of Rimini. The Arch of Augustus, built in 27 BC, is the most important Roman site in the city. The arch was dedicated to the Emperor Augustus by the Roman Senate in 27 BC and is the oldest surviving Roman arch. The arch marked the end of the via Flaminia, which connected the cities of Romagna to Rome, and spans the modern Corso d’Augusto – the ancient decumanus maximus, which led to the beginning of another road, the via Emilia, which ran north-west to Piacenza. The Arch of Augustus has a single gateway that is 9.92 metres high and 8.45 metres wide, and its style is simple but solemn. The large central arch is flanked by two engaged columns with fluted shafts and Corinthian capitals. The four clipei or shields next to the capitals each depict Roman divinities, with Jupiter and Apollo on the Roman side and Neptune and Roma facing the city of Rimini. The gate acted as a city gate, but also supported a lavish bronze statue of Augustus, depicted driving a quadriga. The arch is also noteworthy because it is especially large for a gate of the time. This may be explanation because the peaceful policy of Augustus, the so-called Pax Romana, made a civic gate that could be closed seem unnecessary as there was no danger of attack. The battlements on the upper part of the arch date from the tenth century, when Rimini was held by the Ghibellines. 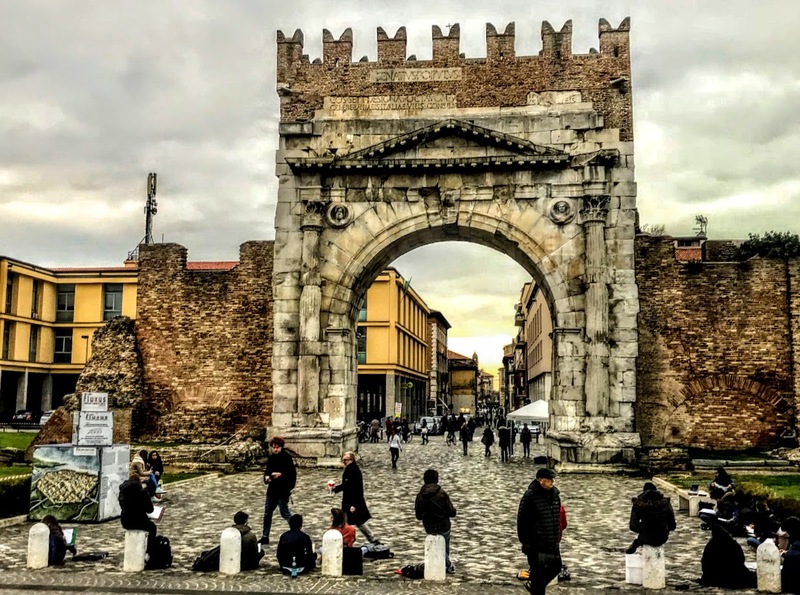 The arch was restored in the 18th century by Tommaso Temanza, and it remained one of the city gates until the Fascist period, when the city wall was demolished and the arch was left as an isolated monument. When the Ostrogoths conquered Rimini in 493, Odoacer, who was under siege in Ravenna, was forced to capitulate. During the Gothic War (535–554), Rimini was taken and retaken many times. Later, under the Byzantine rule, Rimini belonged to the Pentapolis and was part of the Exarchate of Ravenna. During the later wars of the Popes and the Italian cities against the emperors, Rimini sided with the emperors. Sigismondo Pandolfo Malatesta was the most famous mediaeval ruler of Rimini. In 1463. Rimini fell to the Borgias, and then to Venice (1503-1509), but it was later taken by Pope Julius II, and the rule of the Malatesta family finally came to an end in 1528. As a secondary town in the Papal States, Rimini was ruled by an Apostolic Legate. Napoleon’s invading army passed through Rimini in 1797, Rimini became part of the Cisalpine Republic, and the ancient cathedral of Santa Colomba and many other mediaeval churches and monasteries were demolished. Rimini was incorporated into the modern Italian state in 1860. By then, the city was being transformed. The first bathing establishment was founded in 1843 Rimini was on the path to becoming a tourist resort. The seafront developed rapidly, and the Grand Hotel was built near the beach at the beginning of the 20th century. Rimini suffered during the two World Wars, but after its liberation in 1944 rebuilding began, and Rimini became one of the most popular tourist centres in Europe. In the 1960s, Federico Fellini, who was born and raised in Rimini, set many of his moves in his home town. I never managed to get to walk along the sandy shores of Rimini last week, but I did get to see the Arch of Augustus. Today it is one of the symbols of Rimini today, along with the Bridge of Augustus and Tiberius, and it appears on the coat of arms of the city.